When preparing for a college admissions interview common sense dictates you arrive on time and well dressed to make the best first impression possible. Pre-Internet how you dressed and behaved in your spare time would be private. Not anymore – with the rapid rise of social networking, and most notably the success of Facebook, it is possible for a college admissions officer to see what you are up to after hours and on weekends. That critical first impression may happen before you arrive in person. According to 2010 Kaplan survey, 10% of college recruiters already use social networking sites like Facebook to evaluate applicants (read more…), and at a recent Dublin High School Junior / Senior Night one Dublin High counselor noted that some college recruiters hold “Facebook Fridays” to further screen applicants using Facebook. The extreme solution is to go offline – to remove yourself completely from the online world. That is neither realistic nor necessary. Less extreme is to never post anything on Facebook that you wouldn’t want a college admissions officer or potential employer to see or read – while advisable, that’s also difficult since your Facebook friends may be the source of embarrassing photos or statements. 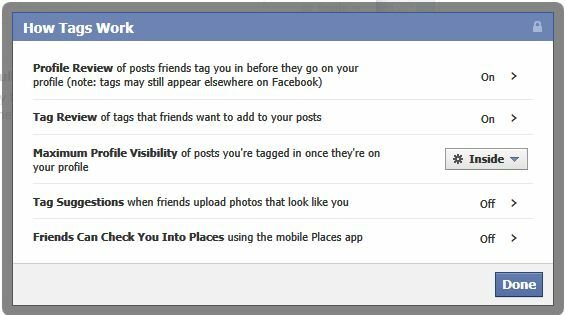 Tighten privacy settings for Facebook tags: by default your friends can tag photos and postings without your approval. Change your “Tags” settings as shown below to better control what your friends say about you. Back on the Privacy Settings page select “How Tags Work”. Make sure you are required to approve tags before they are visible to others (the first two items should be “On”) and how many other people can see items where you have been tagged (the third item). We recommend turning off the last two items (Tag Suggestions and Friends Can Check You Into Places). Control how your Facebook profile is shared: Taking your profile out of search engines isn’t enough – you need to limit how your profile information is shared. 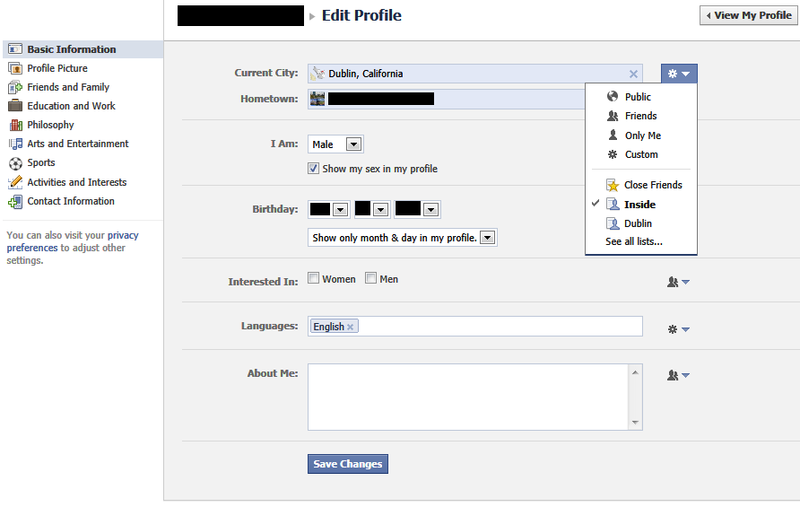 You can change who can see your profile details by selecting “Edit Profile…”. Each detail of your profile (your hometown, age, gender, contact information, etc.) can be completely invisible (viewable only by you), or limited to immediate friends. We recommend limiting all details to your immediate friends at a minimum, and limiting very personal details to just you. 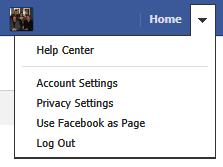 From here you can set the visibility of every aspect of your Facebook profile. When thinking about what you are prepared to share think about what could embarass you, or be used against you or potentially create a security risk. You can also create custom Friend Lists and apply privacy to those lists. Facebook has also recently created automatic groups based on your profile. That’s a basic starting point. 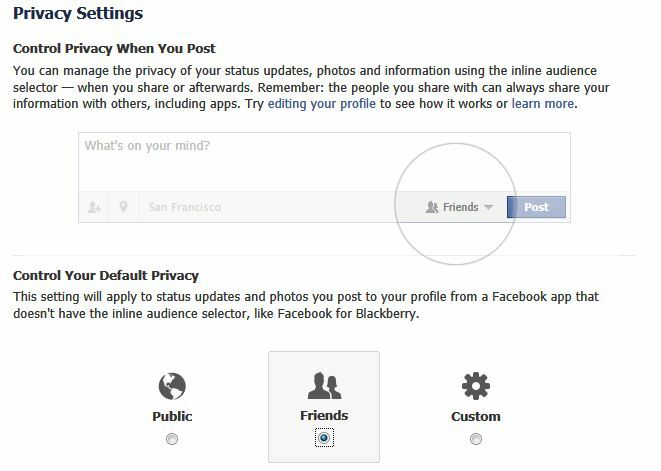 You can go further by limiting the privacy settings for apps, by creating lists of Friends (and what they can see), but taking the steps above will reduce the risk of Facebook postings impacting your college admissions process. with Facebook Fridays – Protect Your Privacy � OneDublin.